Give yourself a new golden rule: always wear this symbol of faith from Apples of Gold. A plain gold cross pendant states your faith without shouting it. This pendant is wrought of high quality 14K yellow gold to ensure it always has that golden glow. The plain cross pendant is free of frilly patterns and only reveals a stunningly smooth surface. The beauty of this simplistic design is that it goes with any style or fashion. From vintage dress to modern vogue, this gold pendant is an effortless emblem of faith. 28mm x 18mm (1 1/8" x 3/4"). 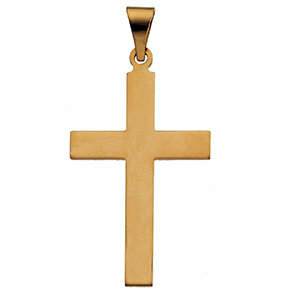 We guarantee our Plain Polished Cross Pendant, 14K Yellow Gold to be high quality, authentic jewelry, as described above.